The Armchair General has a short, but useful, review of Silent War. 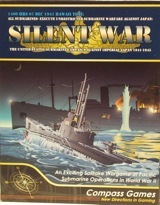 Silent War is Compass Games’ solitaire WW2 board wargame on Allied submarine warfare in the Pacific. The game features individual missions as well as a grand campaign. The game is very good overall and has very nice components. It is reminiscent of Avalon Hill’s classic B-17 Queen of the Skies. If you like WW2 naval games or are looking for a good solitaire game it is worth checking out. The Wargamer has an even more in-depth review of Silent War. Also keep a look out for Steel Wolves in 2009. Steel Wolves is the Silent War system taken to the U-Boat war in the Atlantic. This entry was posted in Board Wargames, Naval Warfare, Reviews, WW2.